Looking for a long running route in the Hamilton, Ontario area? This route is about 80% trail, some paved and some dirt, but mostly all away from roads and traffic. The route can obviously start and end anywhere. We started at Bayfront Park (great for parking, although we live in the area so we walked down). We went for an early sunrise run to beat the heat on Sunday. We've done variations of this route before. It's a good one! Starting at Pier 4 Park through to Bayfront park and following the waterfront trail into Westdale (lots of coffee shops and stores if you need a pit-stop) across Churchill Park and South on Dalewood Ave., and across Main Street, we made our way onto the Hamilton-Brantford Rail Trail where we would run for the next hour. There's a good washroom opportunity at the Fortinoes Supermarket at km 8, but not so great to fill up on WATER. Also, Fortinoes doesn't open until 8am. We were too early this time around! The trail tracks straight through residential Dundas (we get a great view of the backyards that look onto the trail) into the Dundas Valley Conservation Area. It is common for us to see deer, fox, rabbits and other animals along the trail. Today, we spotted a mama deer with her two fawn. Drinking water tap at km 14 right where we left the Ham-Brant trail and entered the Main Loop Dundas Valley trail. Today, this was an amazing site. Already, by 8 am it was close to 30 degrees C.
This is a truly beautiful area, so we were sad to have to start curling back towards our starting point. "The Dundas Valley is one of southern Ontario's most spectacular natural treasures. Highlights of the 1,200-hectare conservation area include lush Carolinian forests, colourful meadows, cold-water streams, stunning geological formations and an array of rare plants, birds and wildlife." At the Sulphur Springs parking lot we left the forest and slithered our way into Ancaster by way of a very small shoulder on a mostly uphill Sulphur Springs Rd. At about 18.5 km we hooked up with the Radial Trail (a little tricky to find... behind the tennis club down the dirt hill). Following the bike route signs, this trail brought us down the escarpment to Chedoke Golf course and another water fountain. There are quite a few different options to get back from this point. We chose to continue on to Dundurn Street and zig zag through downtown and back to our starting point, close to Bayfront Park. There you have it, 30 km total, about 20 km of which is off road multi-use recreational trail. That's a pretty good ratio for a very urban downtown start/finish. Four Years and Ten Marathons and Plant Powered all the way!! 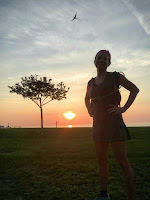 Life got busy and while this blog sat untouched for too long, we continued to live, run and eat with a Plant Based Diet. This year marks FOUR years as vegan runners (and cyclists) where we continue to find ways to strengthen our bodies through good nutrition, regular exercise, 7-8 hours of sleep each night and a balanced work/life schedule. I am a different person then I was four years ago, physically and mentally. I look at the world differently, people differently. In a more gentler way, more accepting. Balancing my health and my time has become a vital part of who I am. Modelling this lifestyle to my family, my social networks, my colleagues and my students is important. Health is most important. People often ask how we manage to eat plant based with a family. I should clarify. We have two boys. Our 15 year old, Jack, while I wish I could convince him otherwise, eats plenty of meat. He loves to cook and will cook his own chicken, fish or beef recipes. While he loves anything home cooked, he will never pass up a restaurant meal, so long as it isn't anything fast food. We respect his decisions and thankful that he doesn't drink high sugar drinks (pop) or eat fast food. Our younger boy, Nathan is a Pescetarian. This means that he eats fish, but no other meat. He also eats plenty of dairy (especially ice-cream). We eat dinner together, as a family almost every night. This can be a challenge at times, but we've grown accustomed to it. We try to have a dinner "theme" in mind and then make the necessary accommodations to fit everyone's needs. For example, Mexican night would be wraps and everyone can add their own ingredients. Pizza nights work well as well because everyone can build their own pizza. Last night we had vegetarian pasta but the kids used enjoyed a little parmesan cheese on the side and tonight was 'burger night' with everyone enjoying their own kind of summer sandwich. Labour day is tomorrow. As school starts up and life gets busier for all of us, we vow to maintain good health and good life balance. Today, we signed up for the Scotiabank Toronto Marathon which means we have to work harder and train more. This was our first marathon, three years ago! This year, it will mark our TENTH marathon together. Eleventh for Brad, who ran the Boston Marathon last year! And for this BLOG. We are going to start sharing our routes and perhaps some of the stories along the way. Today was a 30 km loop, almost all trail. That is for another post.